Joyce Wycoff Connecting through Art: What Leap Will You Make in 2012? What Leap Will You Make in 2012? It's only one extra day, but there is something special about a leap year. It seems so full of possibility. Last leap year, I took advantage of the Sadie Hawkins' tradition and proposed to a man who didn't say "Yes." At the time, I thought it was devastating, not knowing that the Universe had a totally different leap in mind for me. It makes me a little hesitant about trying to plan or predict the leap coming in 2012. But I know it's coming. I see tender possibility sprouts shooting up all around me ... art, a possible move, a new workshop. But, one thing I've learned along the way is that the Universe is full of surprises. The sprouts I see may or may not take root, but I'm sure that sprouts I can't see will leap out of the ground, shouting "Surprise!" They might be delightful surprises or challenging ones, but, either way, they will offer me new lessons and possibilities for growth. At a ritual gathering on solstice, we were given the opportunity to let go of something that no longer serves us by writing it on slips of paper and burning them. I let go of the illusion of control. Maybe that's the great lesson of leap years ... do what we may, we can never control anything except our reactions to what comes our way. What possibility sprouts do you see for the coming leap year? And, how do you cope with the inevitable surprises? May all your leaps in 2012 have a soft and gentle landing in delight, love and abundance. 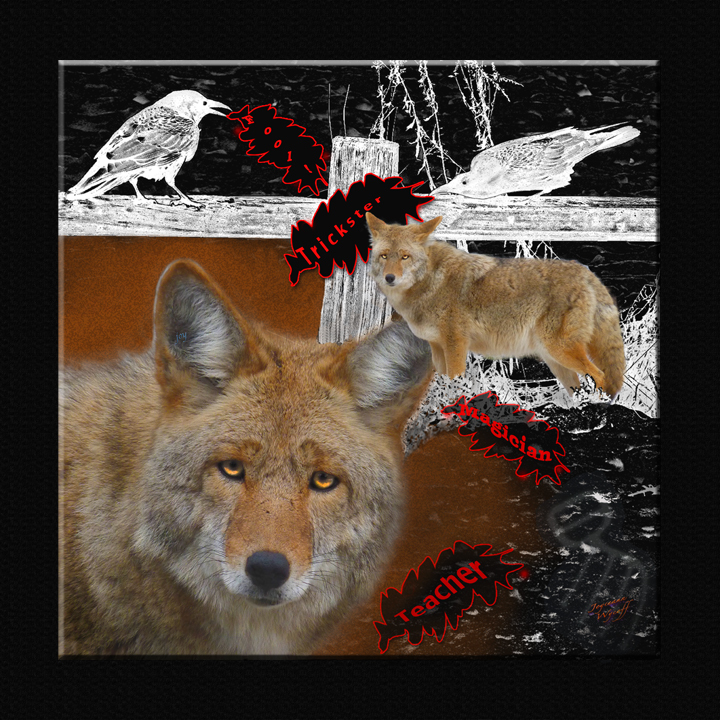 About this image: "Coyote the Teacher"
The theme for Timberline Gallery's new show, which opens January 3, is "animal totems." I will be entering this work which was prompted by a close encounter with coyote last summer. While driving through Yosemite, I spotted coyote by the side of the road and stopped to take a picture. I expected to only get a quick shot or two ... but he stayed there calmly posing for shot after shot. A friend later told me this means he had a message for me. I'm not sure I got the message but I love his face and the ravens that were playing in the background. I admire you very much, Joyce. Wishing you all the joys of the coming new year. thanks for the inspiration -- love the photo -- and that face.... awwwww! Calling All Women Who Have "Been There"